Caliburn House is haunted - but who exactly is the terrifying Caliburn Ghast, and what is it running from? The Doctor and Clara travel to 1974 to uncover the house's secret, but behind her back, The Doctor begins to unravel more of Clara's mystery... spoilers, of course, beyond the cut! ... eeew. Nasty, but great, prosthetic work there! The small cast (5 people? Surely that's got to be the smallest cast for an episode in quite a while!) performed wonderfully - standouts have to go to Jessica Raine's Emma (can't wait to see her as Verity Lambert), who sold the pain of being an Empath, as well as her feelings for Palmer, rather well, and Jenna Louise was once again hitting it out of the ballpark as Clara. 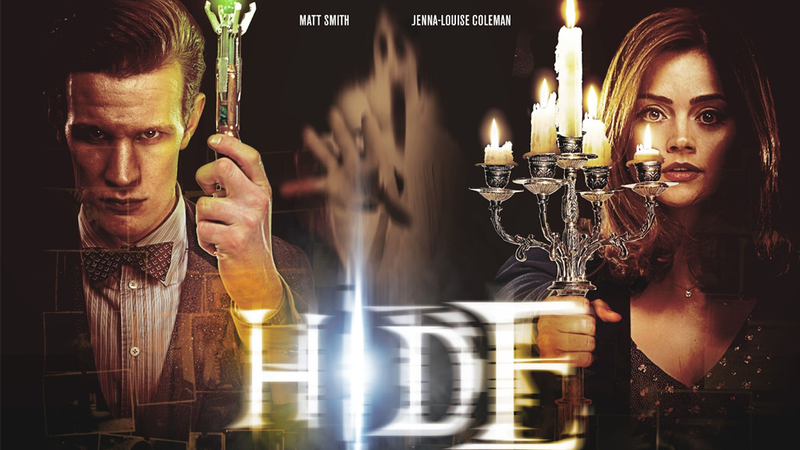 Even though Hide was the first episode she filmed (and it ever so slightly shows - I don't think the confidence of her performances in either The Bells of Saint John or Cold War were quite there yet here), all the foundations of her great performance so far as Clara were there - the scene in the TARDIS where she confronts the Doctor about Time Travel, especially as she watched the future of earth play out on the display screen, was brilliantly done. It's all in the eyes for JLC, and she sells that moment perfectly. My only real complaint - and it's been a growing complaint recently, especially Series 7 - is that the sound mix for the episode was absolutely shocking. It didn't help that much of the cast were spending most of the episode whispering, but I found myself struggling to hear exact lines of dialogue, either because the voice mix was down so low it became incomprehensible, or because some overtly loud snippet of Murray Gold's soundtrack was suddenly blaring over it. A lot of people have complained about the sound mix in Who in the past, it seems, but tonight was the first time I really struggled with it. It took me out of the story, trying to struggle to hear lines, which was a real shame because atmosphere was everything in this episode. Like Cold War, this would've felt fantastic back in the autumn 2012 run of episodes, rather than going out at 6.45 on a splendidly bright British evening in spring. But overall, a decent, creepy slice of Doctor Who. Whilst not particularly amazing, it wasn't particularly bad - a nice, cosy, visually rich, run of the mill episode. Huzzah!